It might cost me $11.52 to drive south of 60th Street in Manhattan. And that’s after paying $12.50 at the Lincoln Tunnel and a Jersey Turnpike toll. That extra $11.52 (I’m not sure how they got that amount) would be the congestion pricing fee. Now that the New York State legislature said yes to the plan, NYC will become the first U.S. city to use downtown congestion pricing. Here an economist might say that the law of demand kicks in. When price rises–it’s free now–the quantity people are willing and able to purchase decreases. So, if you charge to drive in a certain area like below 60th Street in Manhattan, then you wind up with fewer cars. It’s not quite that simple. Today, let’s look at the details. Then, we can consider the externalities. The NYS legislative just said yes to congestion pricing and a commission to figure it out. All they know is that there will be a charge and the revenue will go to mass transit. Because the average speed in midtown Manhattan is between 4.5 and 9 MPH, congestion pricing advocates want cars to move faster. With fewer cars, air quality could improve. Space also could be used differently when fewer cars occupy the streets and we don’t need as many parking spaces. It all could add up to a more efficient, less aggravating, and healthier city. The basic concept involves charging a fee to people who drive in the “cordoned” area. The question though is how much and who. You could have one amount or it could be variable, depending on traffic volume. It could apply to all vehicles or depend on the type. After all, people drive commercial, passenger, and emergency vehicles. They ride on motorcycles and mopeds. They take taxis, Uber, Lyft and other ride-sharing options. There are horses leading small carriages. We also have different categories of drivers to consider. There are the disabled. You have low income households. We know the targeted area is below 60th street. But we have to consider the vehicles that want to move from lower Manhattan to above 60th Street. On the east and west sides of the city you have the FDR Drive and the West Side Highway. Along those roadways, there could be no charge. But what about the exits? How to monitor who enters midtown? Also, you have drivers who live in the priced area that need to move their cars from one parking space to another because of alternate side of the street parking rules. The fee could apply only during businesses hours. From there, we could ask about weekends and evenings. Do holidays count? Or, it could relate to the number of vehicles. If we look way back to 1975, Singapore had people purchase paper decals for its congestion pricing plan. 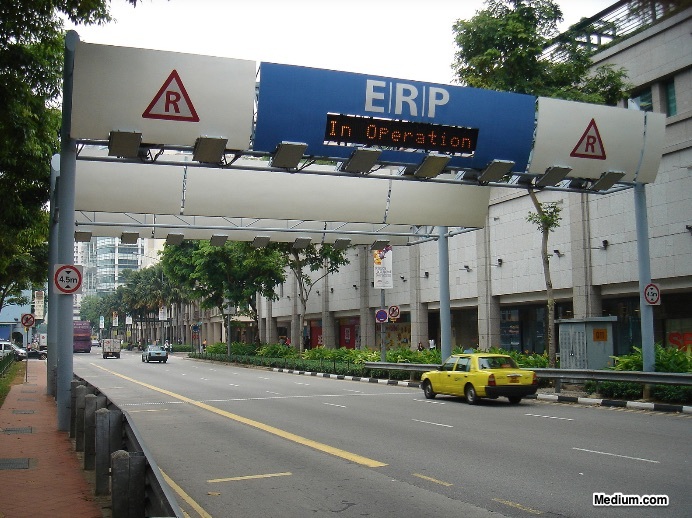 When the Hong Kong system started, drivers were to install an Electronic Number Plate under a vehicle. Then, electronic loops under streets read the plates so drivers could be charged. For Manhattan, planners object to EZPass transponders because they require gantries. It appears they hope someone will invent an app or a GPS device that simplifies the revenue side. As economists, we could say it is all about externalities. Defined as the impact on an uninvolved third party, an externality can be negative or positive. People want congestion pricing because too much traffic creates negative externalities. You know what they are. We waste huge time, the air is more polluted, the noise is irritating. Congestion slows business and diminishes pleasure. As you might be thinking, the gargantuan number of details that compose a congestion pricing plan will surely lead to a slew of new externalities. Who you are and what you do will determine whether the impact is positive or negative or both. However, I can be sure that my hour’s drive to and through NYC will certainly change. My sources and more: With NYC’s congestion pricing almost a done deal, the articles are everywhere. Politico, WSJ, Medium, the NY Times, Curbed, AMNewYork, and City Lab are some possibilities.